Triple berry crisp is a delicious and easy baked fruit dessert, using a blend of blueberries, blackberries, and raspberries. This simple dessert recipe can be made with fresh fruit or frozen fruit. *This post is sponsored by I Can’t Believe It’s Not Butter® through their partnership with POPSUGAR. While I was compensated to write a post about I Can’t Believe It’s Not Butter® Deliciously Simple™, all opinions are my own. 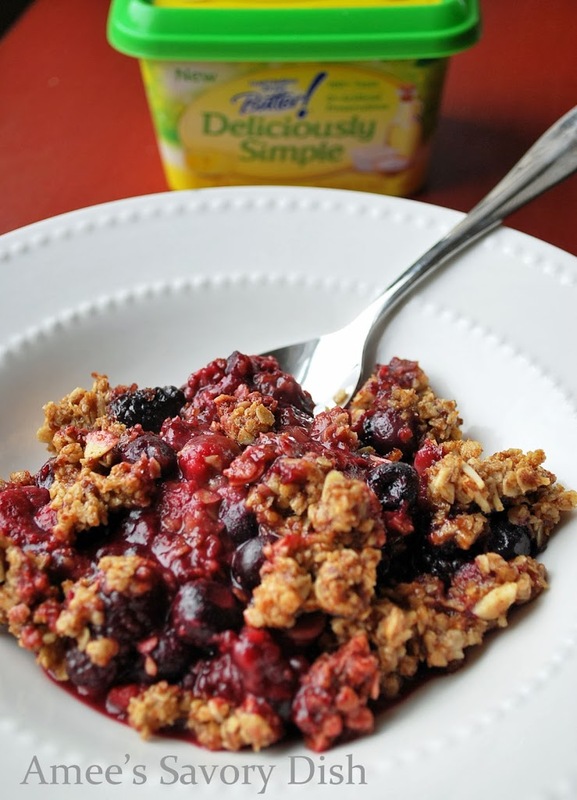 This recipe for triple berry crisp uses the new I Can’t Believe It’s Not Butter® Deliciously Simple™ spread. This new spread has no artificial preservatives, no hydrogenated oils and no cholesterol per serving. It’s made with simple ingredients, such as canola oil, yogurt and salt. 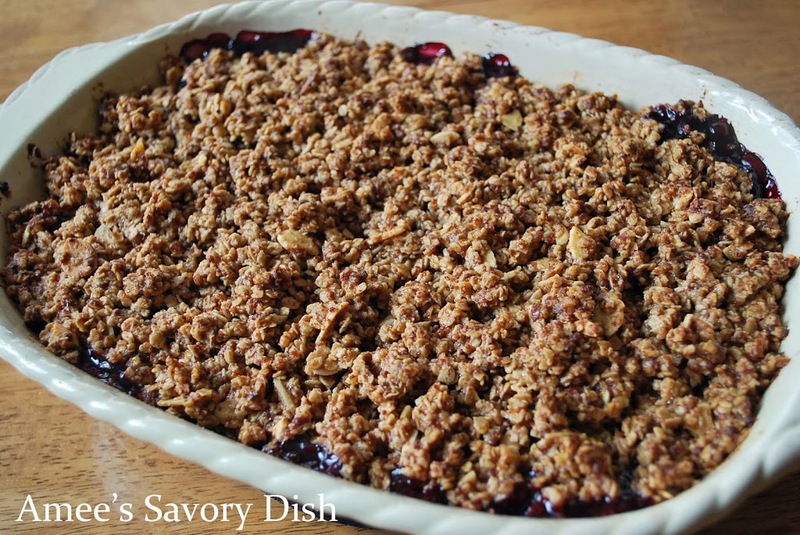 The spread works beautifully in this baked fruit crisp recipe with it’s creamy, buttery taste and texture. You can find out more information about this product here. 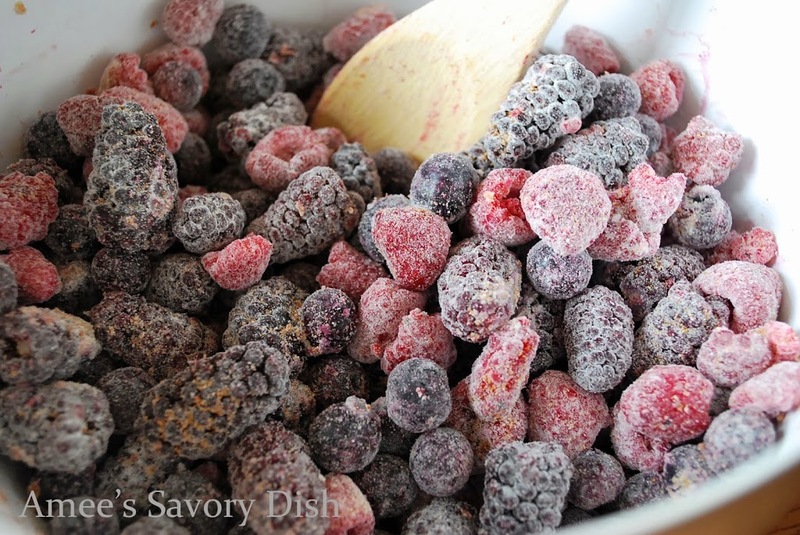 My family absolutely loves this triple berry crisp, and it’s a much healthier version of the classic crisp recipe. I have made this recipe in a gluten-free version (for my gluten intolerant husband) and it is equally delicious. I can’t wait to try the topping with apples and pears! Preheat oven to 350 degrees. 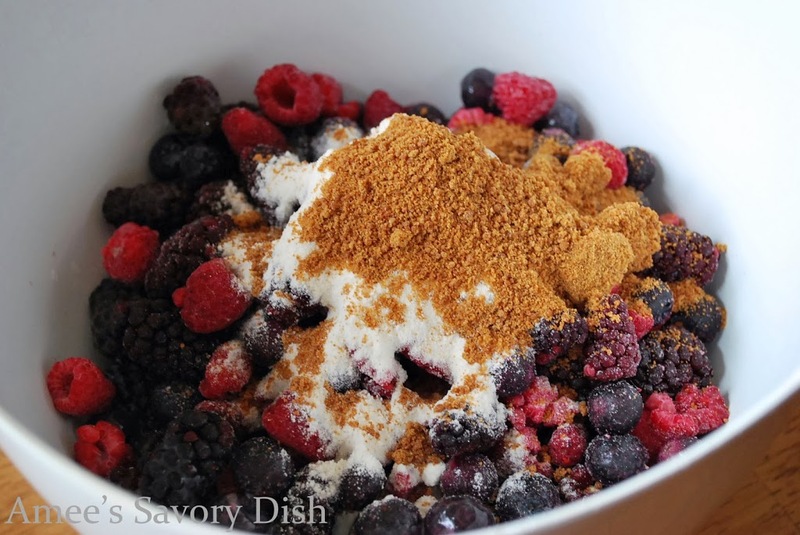 Mix first 4 ingredients together in a large bowl. Toss to coat berries and pour into a greased casserole dish. In the bowl of an electric mixer, place remaining ingredients for the crumbled topping. Mix on low-medium speed until mixture sticks together with a crumbly texture. Place topping over the berries and bake for 1 hour until filling is bubbly and topping is golden brown. Enjoy with your favorite vanilla ice cream or topping of choice. Preheat oven to 350 degrees. Mix first 4 ingredients together in a large bowl. 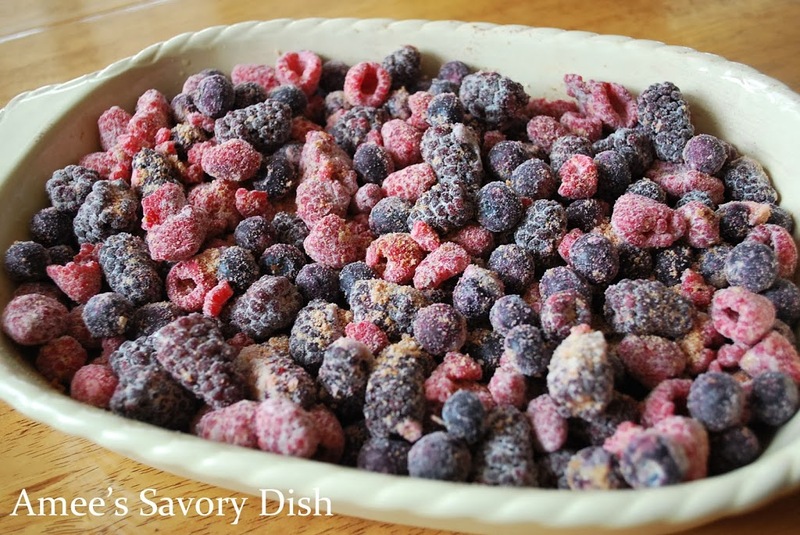 Toss to coat berries and pour into a greased casserole dish. 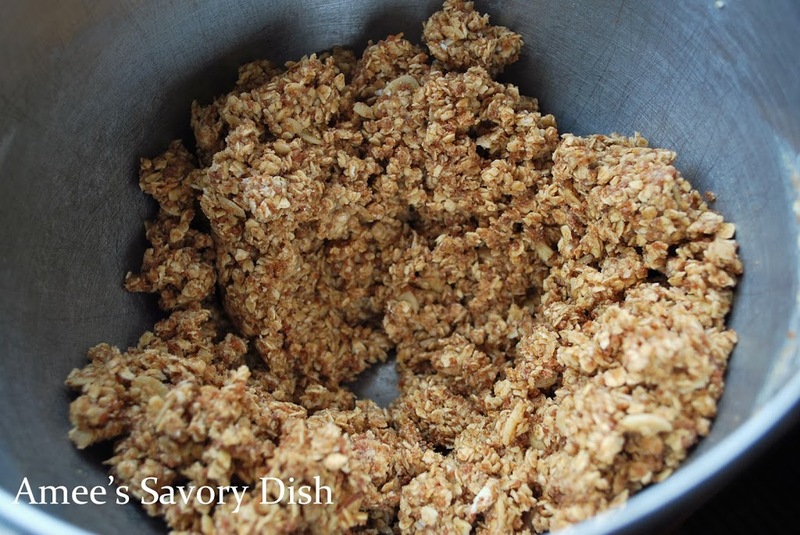 In the bowl of an electric mixer, place remaining ingredients for the crumbled topping. Mix on low-medium speed until mixture sticks together with a crumbly texture. Place topping over the berries and bake for 1 hour until filling is bubbly and topping is golden brown. Enjoy with your favorite vanilla ice cream or topping of choice. If you love this triple berry crisp, I bet you’ll love these easy fruit dessert recipes, too! I’ll be trying this recipe with gluten free flour. Can’t wait. Thanks!